auto123 / Spectacular / Comments Off on F1 car drives on the road like a boss! F1 car drives on the road like a boss! 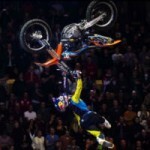 The best of Robbie Maddison… this guy is crazy talented! He almost fell off that cliff!